The Eastern Wyoming College Lancer rodeo team recently competed in the Chadron State College rodeo held in Chadron, Nebraska where EWC team ropers finished in three of the top ten spots. Sophomore team roper Levi O’Keeffe, Mohall, ND and partner Brady Wakefield, Gillette College, won the team roping with a time of 13.0 seconds on two rounds. Torrington freshman Logan Milligan and partner Joby Barquin, Casper College, were second in the average with a time of 15.0 seconds. Fifth in the average were the team of Blaine Finney, freshman, Ainsworth, NE and Denum Santero, sophomore, Minatare, NE. AJ Freeman, sophomore, Valentine, NE was third in the steer wrestling and third in the tie down roping. Teammate Dustin Dailey, sophomore, Long Pine, NE was 7th in the steer wrestling. Sophomore Bailey Schaack, Hyannis, NE, qualified for the short round in the barrel racing and teammate Shai Schaefer, sophomore, Torrington, WY qualified for the short round in the breakaway roping. The Lancer rodeo team will travel to Sheridan, Wyoming for their next competition. Sophomore team roper Trey Yates from Pueblo, CO started off the fall rodeo season by winning the long go around with partner Brit Ellerman who is a member of the UW rodeo team. The pair went on to win the short go around at the Central Wyoming College rodeo with a time of 7.2 seconds. Teammates Tate Benson, freshman, Scobey, MT and partner Cotey Hansen, sophomore, Berthold, ND were second at the rodeo. Also qualifying for the short go round of team roping were Trevor Schnaufer, freshman, Pueblo, CO with partner Clint Buringa, UW; Levi O’Keefe, sophomore, Mohall, ND with partner Brady Wakefield, GC; freshman Logan Milligan with partner Joby Barquin, CC; and Caden Packer, sophomore, Sturgis, SD and partner Syerra Christensen, LCCC. In the bull riding, sophomore Dalton Cunningham, Bloomfield, NE, won the rodeo with a 77 point bull ride. Steer wrestler Danny Manning, freshman, Hemingford, NE, was 8th in the long go around and finished the rodeo in 7th place in the average. Sophomore Bailey Schaack, Hyannis, NE, was 8th in the barrel racing. The Eastern Wyoming College Library will host Wyoming Author Craig Johnson on October 3, 2014 at 12:30 pm in the EWC Library. This is part of the One Book Wyoming program that is sponsored by the Wyoming State Library http://onebook.wyo.gov/. Johnson, who is from Ucross, Wyoming is the author of eight novels in the Walt Longmire mystery series, which is the basis for the hit drama, Longmire, starring Robert Taylor, Lou Diamond Phillips, and Katee Sackoff. It has garnered popular and critical acclaim. The Cold Dish was a Dilys Award finalist and the French edition won Le Prix du Polar Nouvel Observateur/BibliObs. Death Without Company, the Wyoming State Historical Association’s Book of the Year, won France’s Le Prix 813. Another Man’s Moccasins was the Western Writers of America’s Spur Award winner and the Mountains & Plains Independent Booksellers’ Book of the Year, and The Dark Horse, the fifth in the series, was a Publishers Weekly Best Book of the Year. Junkyard Dogs won the Watson Award for a mystery novel with the best sidekick, and Hell Is Empty, selected by Library Journal as the Best Mystery of the Year, was a New York Times best seller, as was As the Crow Flies. Mr. Johnson will have books available to purchase and sign. This event is free and open to the public with the library providing light refreshments. The EWC Library is located at 3200 West C Street in Torrington. For more information, please call the Eastern Wyoming College Library at 307.532.8375. The Eastern Wyoming College Lady Lancer Volleyball team in conjunction with EWC Student Senate and Student Housing will play for Suicide Awareness on September 30 at 7 pm as they take on Laramie County Community College. T-shirts will be available for a free-will donation, a 50/50 drawing will be held with the proceeds going to help former teammate Devin Williams and her sister’s scholarship fund. Student and instructor volunteers from Eastern Wyoming College helped stuff back packs at Torrington Middle School on September 24. 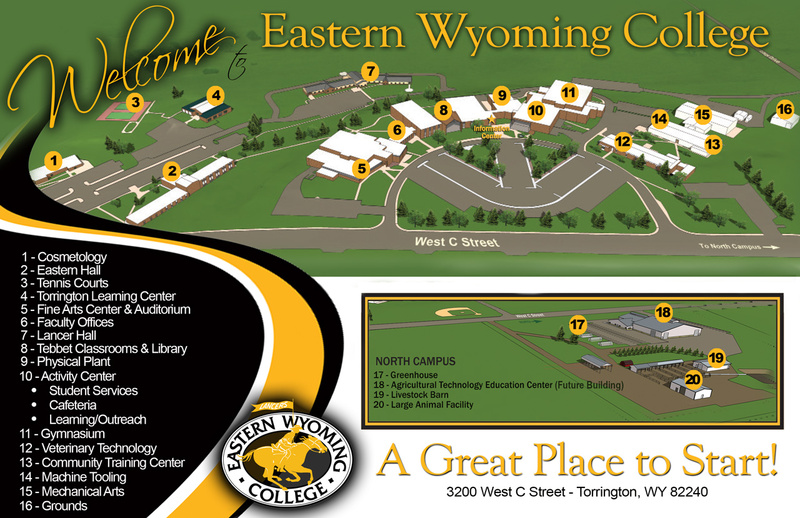 Eastern Wyoming College will host a two-member team on campus in Torrington on October 6-7, 2014 for a Higher Learning Commission (HLC) Focus Visit on Diversity. Team members include Dr. Benjamin Young, Vice President for Diversity, Equity, and Inclusion at Ivy Tech Community College of Indiana and Dr. Iwalani Else, Director of Institutional Research and Assessment at College of Saint Scholastica. While on campus the team will meet with EWC administration, faculty, staff and students regarding the College’s diversity efforts. For more information regarding this HLC visit, please contact Dr. Dee Ludwig at 307.532.8221 or by email at dee.ludwig@ewc.wy.edu. The Eastern Wyoming College Lancer Golf Team finished the Otero/Lamar golf tournament in second place with a score of 612 for the team. EWC Lancer Aaron Nirider, a sophomore from Riverton, WY, lead his team with a second place finish overall with a total score of 140. The Lancer golf team will travel to Trinidad, CO for a tournament on September 25 & 26. The Eastern Wyoming College Lancer Golf Team finished in second place behind Trinidad at their home meet held in Torrington. The Lancers finished with a score of 614, just four strokes behind Trinidad at 610. The next tournaments for the Lancers are in Otero and Lamar, CO. The Eastern Wyoming College Lancer Golf Team began the fall season with a tournament in McCook, NE. The Lancers finished the two-day tournament in second place with a score of 666. Individual scores for the Lancers were as follows: Josh Wilson, sophomore, West Haven, UT – 156; Logan Harrison, freshman, Cheyenne, WY – 167; Deyton Klein, sophomore, Holyoke, CO – 171; Aaron Nirider, sophomore, Riverton, WY – 172; Cam Taylor, freshman, Chubbuck, ID – 179 and Chandler Meeboer, sophomore, Casper, WY – 193. “This was our first tournament of the year and we learned from tough conditions and a tough course. We will continue to work hard at getting better,” shared Coach Zach Smith. Eastern Wyoming College is now accepting registrations for Little Diggers Volleyball taught by EWC Volleyball Coach Julie Sherbeyn and the EWC Lady Lancer Volleyball team. Little Diggers Volleyball is designed to introduce the game and fundamental skills of volleyball to elementary aged boys and girls in a fun and safe environment. The class takes place on 4 consecutive Saturdays. Please indicate school grade and t-shirt size at the time of registration. Saturday, September 27th is the first session and the class will run through October 18th. Grades K-3 will play from 9 – 10 am with grades 4-6 playing from 10:15 – 11:30 am. The cost of $35 and will include a t-shirt. To register please contact EWC Community Education at 307.532.8323 or 307.532.8213.